As you are all aware, Charlie’s life has changed pretty dramatically over the last 6 months. While we have tried to keep things as normal as possible, the addition of a baby human into our home has turned everyone’s life upside down. Despite getting the same (if not more) walks daily, Charlie is bored and sometimes a little jealous of all of the time and attention the baby gets. He loves the baby, and often wants to play with him, but a nearly 6 month old, is just not up to the task. Another big change for Charlie is that he has started his work as a school therapy dog three days per week. On the days that he is “working”, Charlie is ultra stimulated and exhausted. Unfortunately, the flipside of his therapy work is complete BOREDOM on the days that he is home with just Kev or the baby’s nanny. They are sponsoring this post so that we could spend some time with the unit and share our experience with you! CleverPet is the first ever game console for dogs. Designed by cognitive scientists, the CleverPet was created in order to “keep your dog busy and out of trouble for hours each day.” In the most basic sense, the CleverPet Hub is a durable, automatic, engaging device that is programmed to provide your dog with various games and activities that adapt to skill level and leave your pup engaged throughout the day – with or without you! 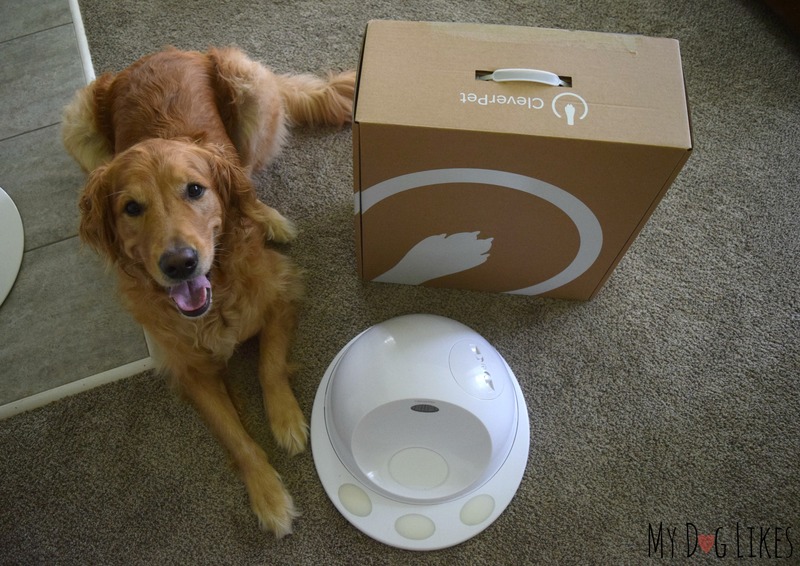 How does the CleverPet Work? The CleverPet Hub works alongside a phone application to provide your dog (or adventurous cat) with hours of entertainment as he or she works through puzzles and games. How you ask? 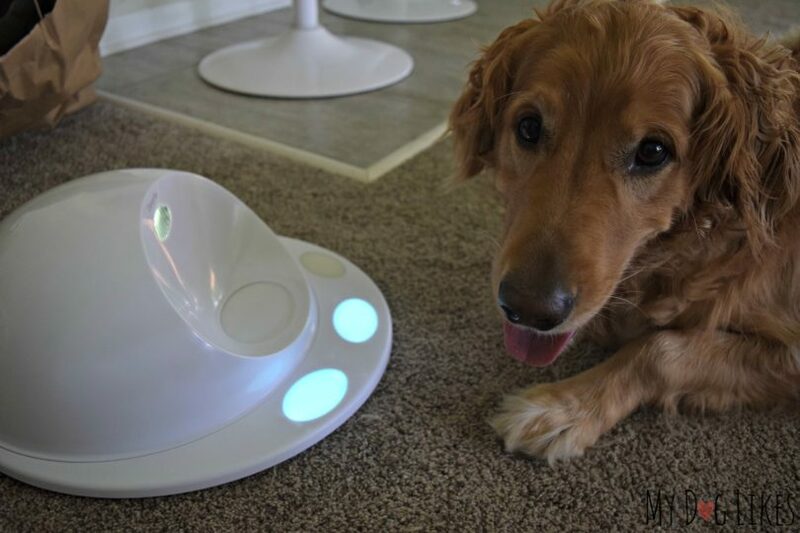 The CleverPet Hub has three light up sensors that, when activated, trigger the release of a treat. If this sounds too advanced for your dog, fear not, the CleverPet is designed to teach your dog how to engage starting with simply taking a treat from the dispenser and working its way through increasingly difficult puzzles. The system is responsive to how your pet is progressing through the challenges and only moves them to a more challenging task, when they have mastered the basics. The CleverPet Hub also works with an online application that can be downloaded on the android or apple IOS market. The application has helpful videos, allows you to track your pet’s progress through the challenges, and view detailed reports of their performance. The application is especially helpful if your pet will be playing while you are away or at work! A peek under the hood! The CleverPet Hub is built securely so that you don’t have to worry about your dog getting into trouble while playing on their own. Stainless steel bowl – Allowing for easy cleaning because there is bound to be some drool! Sturdy, sensitive touchpads – Frustration free. Sensitive to soft touches but tough enough for paws and claws. 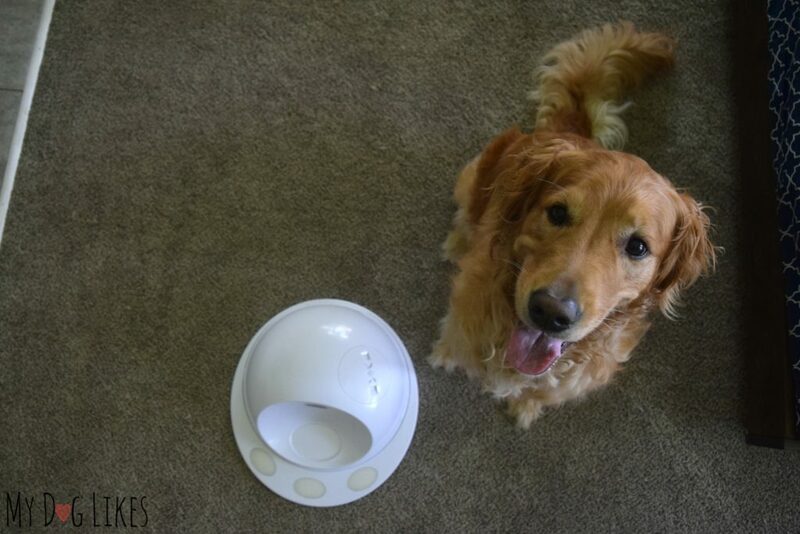 Dog-proof lid – No short cuts to the treats, the unique domed design means your dog CANNOT break into the device to steal the food! Non-slip base – The base is strong and skid-proof so a curious friend can’t push it around on the floor! Setting up the CleverPet Hub is a breeze! The unit was labeled with step by step stickers and other than connecting to your wi-fi and downloading the accompanying app, no technical knowledge is required. We ran into some problems (it ended up being the wrong password for our WiFi and not a problem with the unit), but technical support was responsive and gave us some excellent troubleshooting tips. 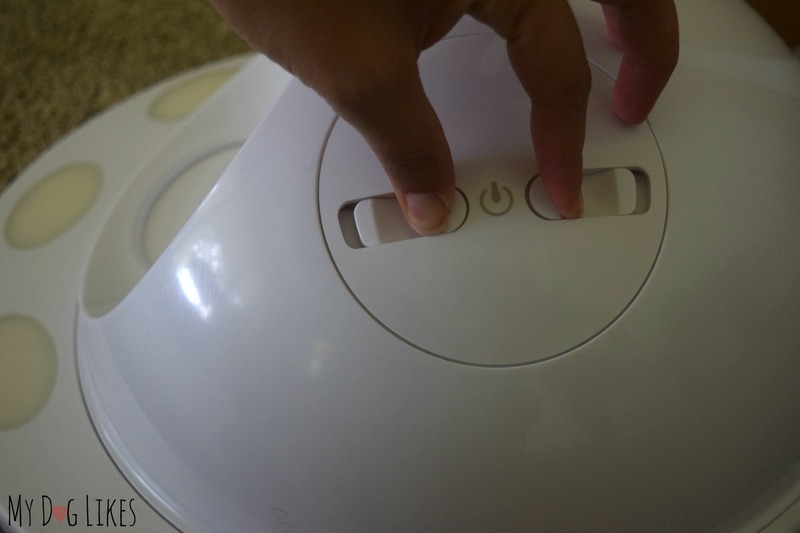 In order to fill the CleverPet with treats, simply pinch the two tabs on the top of the unit and lift up the small round door. This will expose the orange interior cap of the treat dispenser. Open it up and fill with a handful of training treats or kibble to get started! 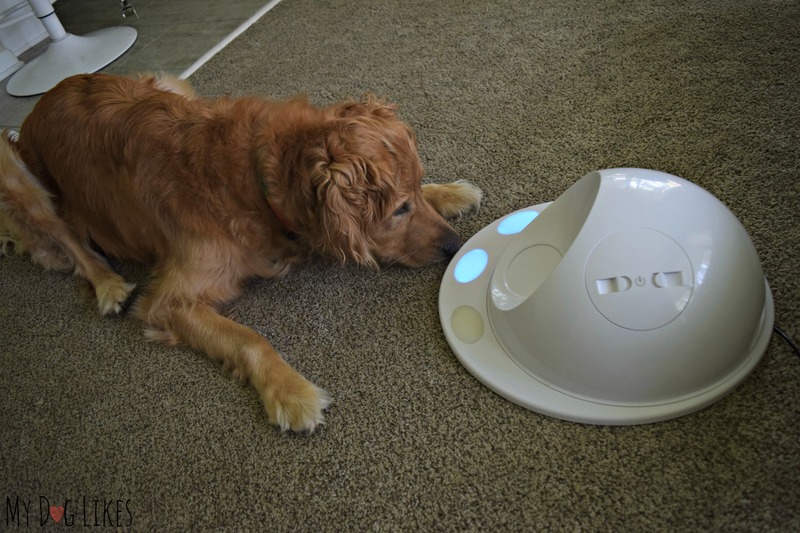 You might be wondering what kind of dog does best with the CleverPet Hub. CleverPet suggests that your dog is food motivated and open to new experiences – size and age are just numbers! Though Charlie can be a bit skittish when he first experiences something new, with a little encouragement, he is eager and excited to try new things, especially when treats are involved! We decided to take the process slow, first unpackaging the unit in front of Charlie so that his curiosity was piqued. In order to make the process really positive, I randomly gave Charlie treats while I worked on setting up the unit. The CleverPet Hub starts at the most basic level; getting your dog used to the food door opening and a treat being present. I thought Charlie might be a little afraid, but all it took was one look into the food tray and he was hooked! He easily made his way through the first “Challenge” of retrieving food from the Hub. The second “challenge” required that Charlie interact with the unit in order to release a treat. He simply had to touch one of the sensors, or if a portion of time had passed without interaction a treat would be randomly released. It was here that Charlie started to make the association that playing with the unit led to tasty rewards! Currently, Charlie is working through the third challenge which requires that he touch the sensors which are illuminated while avoiding those that are not. While Charlie loves a good challenge, we have taken our time getting through this task in order to keep his frustration low. Charlie is still working on learning to notice the lights and prefers to continue to choose the sensors at random barking at the unit when he doesn’t get a treat! 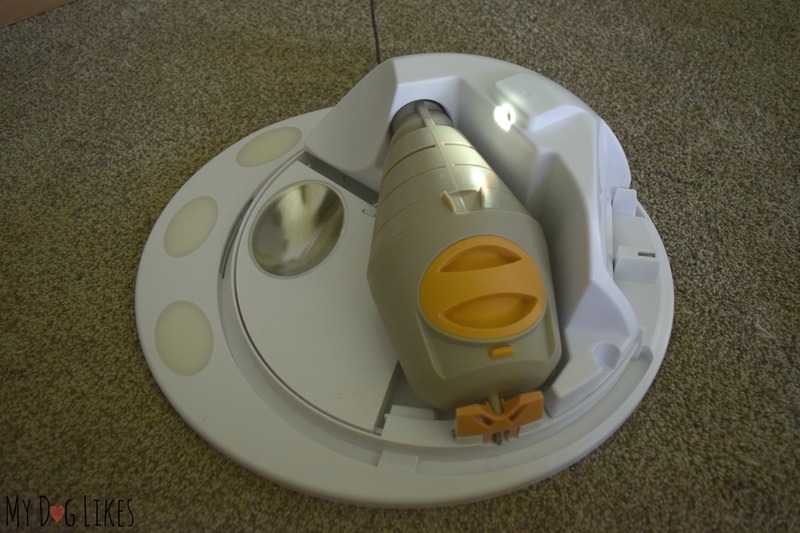 As with anything new, our introduction and use of the CleverPet Hub wasn’t without some challenges and missteps (mostly on our part). Luckily, we have lots of patience and had help from the wonderful Tech Support (Did I tell you how amazingly responsive they were?!). Charlie is normally not much of a drooler. However, when he gets amped up and there is food involved, he can get a bit slobbery. We noticed that when we used softer treats, Charlie tended to drool a bit more. Unfortunately, the same sensor technology that tells the unit that the treat has been taken from the tray, recognized his drool as a treat. As he was getting used the hub, we simply wiped it on occasion since we were already sitting there with him. When we wanted him to be more independent with the unit, we changed out the treats to kibble which is harder and lapped up better with his tongue. This dramatically reduced our issue with the sensor! Lesson Learned: Hard kibble and not overly “drool worthy” hard treats work best. Whether his frustration was a result of a treat not being dispensed or simply a byproduct of the increasing difficulty of the task, it sometimes led to loud barking on his part. It wasn’t a big deal for him, he was fine. Whenever he had enough we simply unplugged the unit and had him take a break. The problem was that his loud barking scared the baby or worse – woke him up! Unfortunately, it just gave him fewer opportunities to play while we were home! Lesson Learned: Get the baby used to barks and play when he is awake! Since Charlie was limited in the time he had to play while we were home, we left it set up when we were away. Turns out that even when we start playing with him before leaving, when we aren’t in the house – Charlie just sleeps on the couch. He was like a toddler, he liked to play best when we were right there with him. We didn’t really mind though because it was so FUN to watch! Lesson Learned: Have fun with your dog regardless of whether you are right next to them or snooping on your pet cam! We always get really excited to see our dogs’ brains working the way they are supposed to. So many of our pets spend way too much time indoors and lack the stimulation they require for optimum health. With the CleverPet, you can actually see your dog solving problems and feel confident that you are enriching their day to day lives. You don’t need any special experience or expertise to get your dog acquainted with the CleverPet Hub. Before we started that was my biggest worry – I’m definitely not a dog trainer! But in reality, the CleverPet Hub is for everyone. Though Harley is not food motivated, he is a smart and creative problem solver (who does like to eat and is much more patient than his brother) and I think he would do well with it too. We were also very impressed with how sturdy the unit was. Even when Charlie got worked up and tried to gnaw, bark and paw at it, the unit kept functioning perfectly and there wasn’t a scratch on it! We only had one minor fix (a food jam before changing our treats to kibble) but found troubleshooting with tech support to be AMAZING. Even though Charlie has only had limited time thus far to work with the CleverPet Hub, he has loved it and gets excited to play whenever it’s turned on. We look forward to working more with Charlie and advancing through the activities! 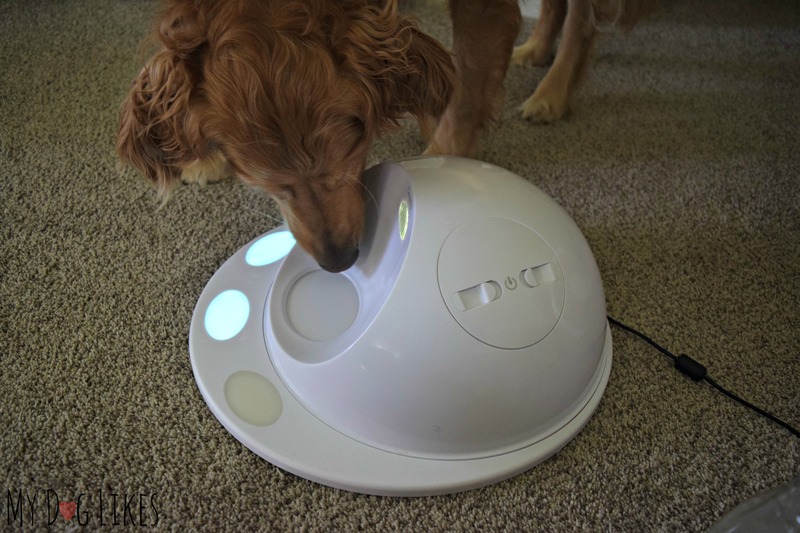 If you have a dog that is inquisitive and likes to get treats, the CleverPet Hub would be an amazing addition to your home! Still not sure? They offer a 60-day engagement guarantee to make sure that the unit is right for your dog! 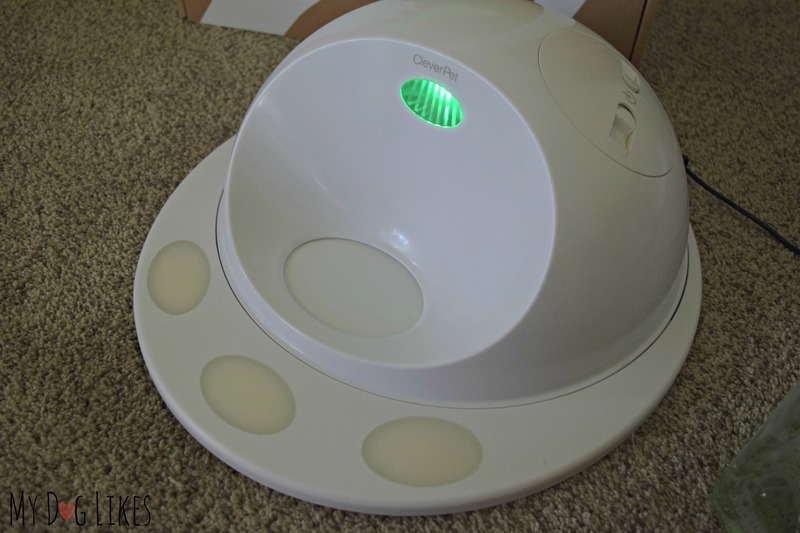 Want to try a CleverPet for Yourself? i think my youngest would love this. the oldest not so much, she is not really into toys or interactive things, but the youngest loves everything. I like that the touch pads for dispensing food. Very clever in deed. Skipper would love the lights. Plus he loves treats. My one dog would love this! The other I’m not too sure, he’s lazy! I love how the activities are tailored to your dogs ability b/c my 2 will definitely not be on the same ability level! I KNOW that my 6 babies would LOVE this console!!! Not only will it keep them occupied but it is something that they can have fun with while learning. I like the app you can use with it to see how your dog is improving. What a great idea. Tech support would be my favorite feature….I know I will need the expertise. 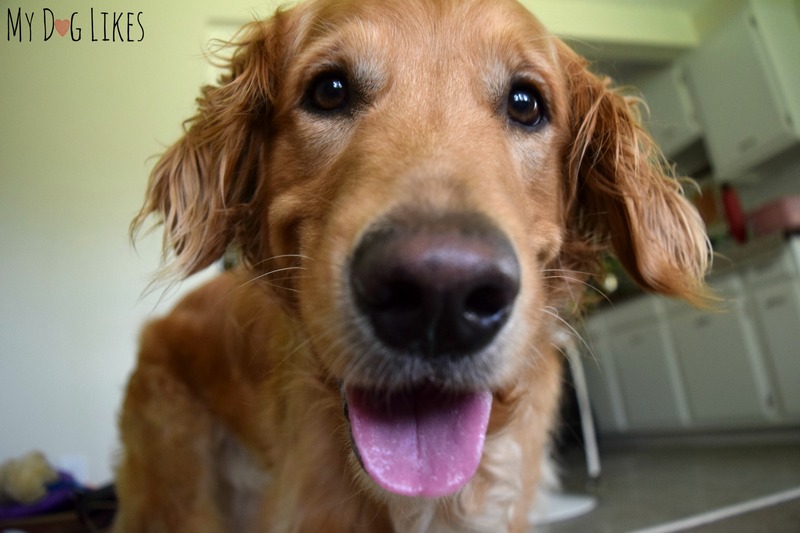 My dog would love the challenge… and also the chance to get extra treats! I think my dog would love it. He has lots of puzzle toys and is very food motivated so I believe it would be really fun for him. I think Cooper would like it. The best feature is the increasingly more difficult levels. A good way to learn. I think that it would be great. I like that it has dozens of new color-based puzzles to solve. We would LOVE to have something like this for our babies when we have to leave them. 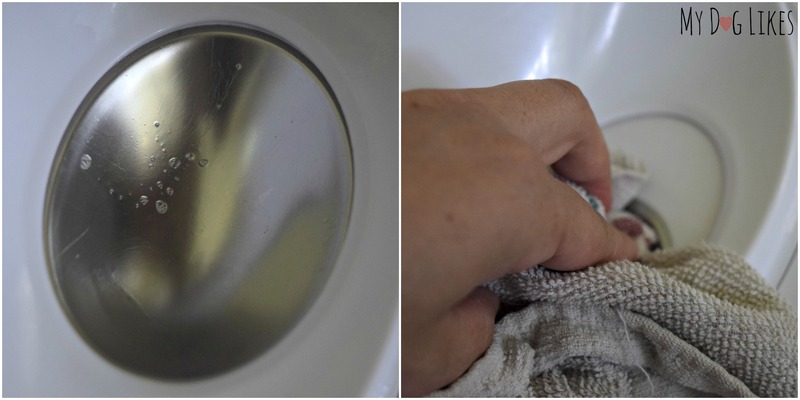 I like the stainless steel bowl and this allows for easy cleaning. My favorite feature is the app, that way I can see when I’m not home how my dog is doing on the game! My dog would love this. He’s smart and likes challenges. The great that it’s made of a sturdy material. Our golden retriever would probably be able to pick this up. I like that they have science to back up there choice of learning games. I’d have to wait and try this out before saying how our dogs would react to it. I think the fact that it’s made so sturdy is a big feature! My 2 year old Golden loves, loves, loves food puzzles & I know he would love to figure out the Clever Pet. I love that there are different learning levels. This looks so futuristic and cool! My Piggie is smart, I’m sure it would be so cute to see him interact with it. This is a really intriguing concept. I think my dogs would have a blast with it. Anything food related gets their vote! I like that the games are adaptable to keep the console inviting. I think that’s my favorite feature. It looks pretty sturdy, which is also a plus. I’d be interested to see what kind of sounds it makes. I have purchased other such items, and the sounds they make scare my dogs to the point they won’t use them, making them a waste of money for us. Would love to try one of these out. I know Colby would be excited about getting food in a new way. He loves anything connected with food! I hope this would keep him busy and engaged. Looks like a fun toy! This looks really cool! I love the challenges and the treat dispensing! I like how it automatically adjusts to the dog’s challenge level. Mr. N enjoys puzzles, I think he would have fun with it. Our dogs would love this! I wonder if my dogs could figure out how to use it. I do like that it could relieve some of their boredom. My dog would love being able to get more snacks out of it. I like that it has different levels. I really like the color match feature. Bella loves a challenge, she will love this! I think Coco would definitely like this b/c she likes other puzzle games. I like that it is easy to set up and that there are different puzzles to do and not always the same one! I think my dogs would respond very well to this. I like how you can adjust for the challenges for your dogs. Thanks! One of ours would be so lazy he wouldn’t use it. The other one would be fascinated. I think my Nancy would love this.. she needs something to keep her busy while we work all day. My favorite feature is that it’s super interactive. I like that the hub interacts with my pets. The touch pads and lights are cool and engaging. My dogs would definitely love this toy. I think my dog would like this. She gets restless sometimes so it would provide stimulation. I like how you can adjust the challenge too. It is not a toy at all. My nosy little Chihuahua would love it. I think at first he would be afraid and suspicious of the hub. But once he finds it is a source of treats he will love it. I think she’d like it! I like that it has a Learning Longer Sequences challenge. My Yorkie Indie would love this, love the feature where dogs can master targeting by touching the one lit touchpad. I can hear a lot of barking coming from my dog, but I think he would love the stimulation when we aren’t home. This is a neat giveaway! My Boston Terrier is very food motivated and has learned to pick up toddler toys off the floor in exchange for a small treat. I think he could figure out a color matching game for the right treat. I would probably donate it to Tx Boston Terrier rescue though. 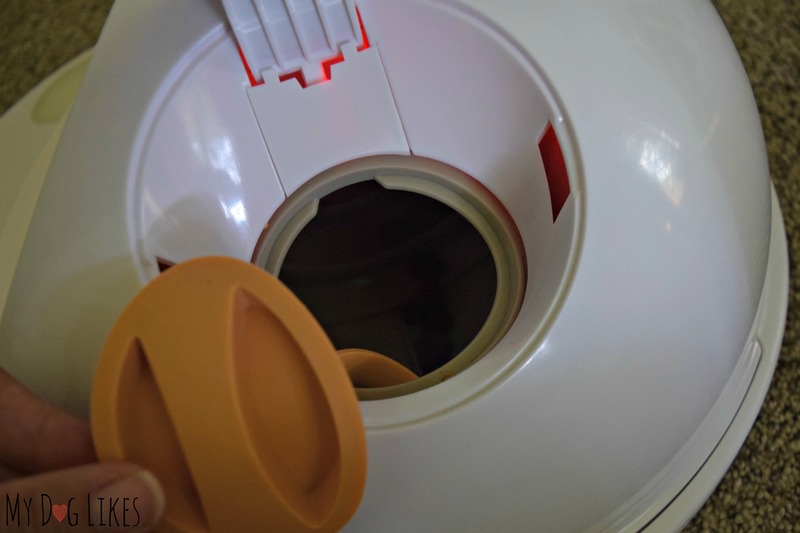 I like that it has a stainless steel bowl so it is easy to clean. I also like that it will help entertain my dog and I can use the app to see his progress. Toby, my Boston, would love this! I like the color match feature, I’m sure my dog would love it! I’m not sure what Milo would make of it. For a tiny fellow he’s pretty clever, but sometimes he gets bored. I like that it has scales in difficulty based on your dog’s ability, so maybe he would stay engaged. My golden is extremely food driven, so I would love to see her be able to use this to work her brain before she gets her food! My little Mister, my Shih Tzu, would probably like this best. He loves the manual puzzle games and will not leave them until he has gotten every single last treat. Our Great Dane, on the other hand, is a very sweet but not so bright girl who gets very bored if she has to “solve” anything and won’t touch a puzzle game or treat toy. Who knows though, she might surprise us! The littler dog is the Alpha though and he would probably take over. I think my dog would love this. She gets bored easily and I think this would keep her entertained. I like the app and being able to track progress. My dobie Zeus would love this! I think Luma would be a little confused at first then super excited! Especially once she found the treats! My dogs would be so excited! I really like that it has its own app for smart phones. It would be fun to follow my dogs’ progress with the device. I think our pup, Zunebug would love this! I like the increasing difficult challenges. Steel would love it and I like the fact that it gets harder for her as she learns. MoJo will be intimidated at first but it will cautiously grow on her as she’s a food lover. I like the progressiveness of it’s treat allowance. Molimo loves new challenges so I think she will love this. I love the fact that it will grow with her growth. My dog would enjoy this- I like the idea of using the app! I think our dogs would be scared at first; but then love it when they realize they can get treats out of it. I love that it seems to be well built and that it interacts with the dogs. I like that the touch pads for dispensing food. I think my dog would be interested in this. I really like the touch pad and how the dogs can get treats. 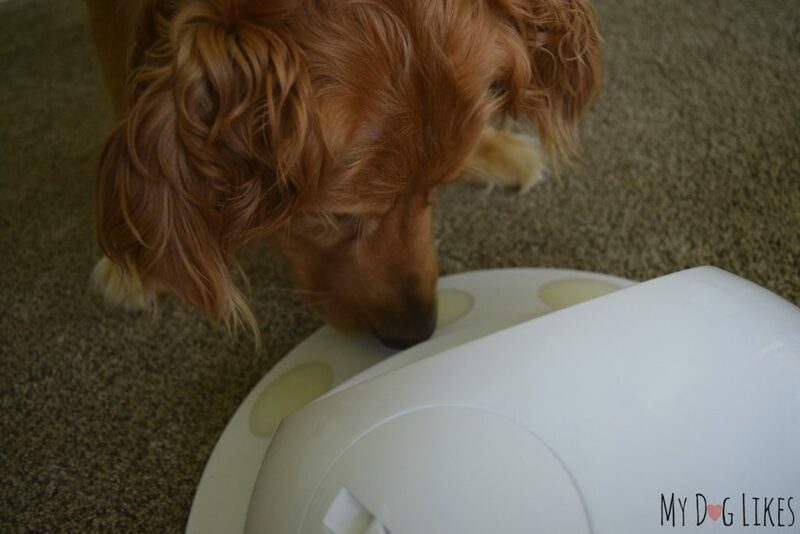 I think this CleverPet product is wonderful. I love that it could help me keep my very active dog busy and out of trouble for hours each day. My favorite features is the Scales in difficulty based on your dog’s ability. My dog would not become frustrated by puzzles that are too difficult. I think our malamute would really go for it. I like the color based puzzles. What a great idea . Getting the live updates is wonderful. My dog would probably be hesitating at first , but once the treats start coming, I know she’d warm up. I love that you can track the progress on an app on your phone. I think my dog would love this and it would keep her busy with the games, which were designed by animal-loving cognitive scientists, keep your dog busy and out of trouble for hours each day. I like that this would work for either my 5 year old grandpuppy or my 9 year old grandpuppy! Both would be challenged and entertained. The puzzles are great! I have three bulldogs. What I love most is this is different than any other item they’ve had.